My nephew Kevin graduated months ago but with one thing and another we’ve had a hard time getting people together. Kevin’s brother Paul is married to Emmy, a fantastic woman from Sweden; her parents have been visiting for the past month and we just couldn’t let them go back home without meeting them. So we put it together at the almost last minute! First the story about the beans. 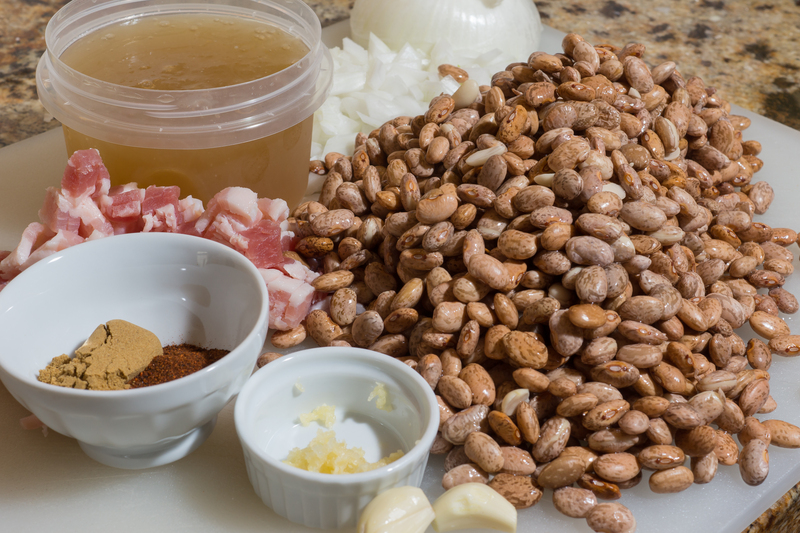 If you follow my blog you’ll know that I have been working my pinto bean recipe for years. I have no fewer than five posts on the topic. If you search for the word “Pinto” on my blog you’ll get more posts than that. I got a point where I could cook good beans in the Dutch oven but switched over to the pressure cooker two or three years ago. I’ve gone back and forth between bacon, salt pork, and ham hocks as the pork. My perseverance has finally paid off; I cooked a delicious pot of beans this past weekend (if I do say so myself). I’ve settled on salt pork as the meat and cooked it in my new Instant Pot Duo 60 electric pressure cooker. This is a recipe I don’t have to share credit with as I’ve worked it out on my own; you can find the recipe here. If you don’t have a pressure cooker, simmer the beans for a couple of hours instead of the 14 minutes in the pressure cooker. Now this dish is a bit salty; if you are sensitive to salt replace the salt pork with 4 or five slices of bacon, diced. Also I use home made chicken stock which has very little salt in it (about 1/32 teaspoon per cup). So if you are using canned stock (even low sodium) you may find using bacon instead of salt pork more to your liking. Want to make your own stock? Check out this blog post, or use this even easier recipe which came from Dad Cooks Dinner. I use Hormel salt pork that is already partially sliced making the dicing a breeze. The back side of the salt pork has a rind on it that you’ll want to trim off before starting to dice it. Pro tip on the picture above: Do NOT stage your ingredients like this. I had to spend about 5 minutes separating the beans from the chopped onion and salt pork before starting to cook. Sauté the salt pork about 8 minutes on medium-low. I switched the Sauté function on the Instant Pot Duo from low to medium a couple of times; I probably could have left it on low if I’d have been patient. Don’t cook it at high heat or you’ll go from perfect and delicious to burnt pork bits in about 30 seconds. Pull out the salt pork with a slotted spoon and place on a paper towel to drain. Then sauté the chopped 1/2 white onion in the pork fat until translucent and browning around the edges – about 8 minutes. Toss in the cumin, chili, powder and pressed garlic and cook until the aroma arises. Add a little water or chicken stock and scrape up the fond from the bottom of the pan. Toss in the beans, the 1/2 onion, bay leaf, 2 whole/crushed garlic cloves and rest of the liquid. Cook under high pressure for 14 minutes in an electric pot or 12 in a stove top. If you don’t have a pressure cooker, simply bring the beans to a boil and reduce to simmer for 1 1/2 hours to 2 hours. Pinto beans ready for pressure cooking. When the beans are close to the end of cooking I boil some water in an electric kettle and use it to think out the beans if the broth is too thick. This is better than using too much liquid at first and ending up with soupy beans. Pinto beans after pressure cooking. Dinner (leftovers) are served: ham, yams, and delicious pinto beans. Enough with the beans, we had a party! Kevin and Linda came in first bringing a Honey Baked ham which they got as a gift from somewhere (I think Linda’s son-in-law Charlie got it somehow and passed the coupon along to Linda when they moved to Spokane). Kevin is studying to be an ER tech. He’s taking classes, riding along on ambulances, and training in emergency rooms around the area. He told a story about how his training allowed him to keep his cool earlier in the day when a friend lost part of his finger trying to break up a fight between two big dogs. I’m glad he was there and not me; I probably would have just fainted! Both my nephew Paul (Linda’s other son) and our son Andrew married women (Emmy and Henriët) who have immigrated from overseas. It was a delight to meet Emmy’s parents Roland and Evalotta. Starr’s husband Jim is a gem; he’s quiet but such a nice guy. I was glad to get a picture of him. DIL (Daughter In Law) Sara. The three sisters are a force; they are so close. I love being part of their extended family. The sissies: Carla, Starr, and Linda. Folks left early because they had to go to work (all except Carla, me, Evalotta and Roland). We had a blast and hope we can see Evalotta and Roland soon.